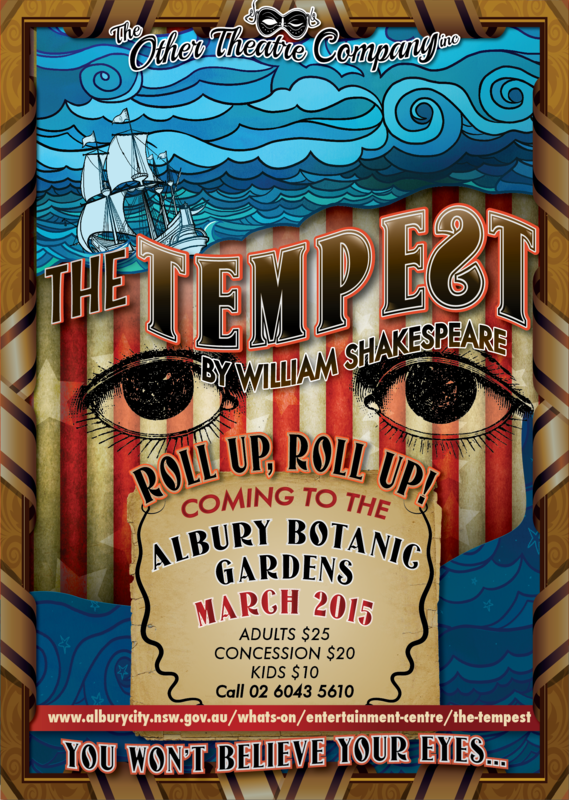 The Carnival will come to Albury Botanic Gardens in March 2016 when our travelling players will set up an old style “side-show fair-ground” for The Other Theatre Company’s production of Shakespeare’s The Tempest. They are marooned on an enchanted isle, and encounter the mysterious Prospero and his beautiful daughter Miranda, both served by the vile and monstrous creature Caliban. Everywhere they turn are the spirits of the air and the earth. Is this Providence that has saved their lives, or something else? Director Alexander Langton says, “This is regarded as one of Shakespeare’s more mature works, written towards the end of his career as a playwright. Following on from their successful, “A midsummers night’s dream” in March 2014, and “Much ado about Nothing” in 2015, The Other Theatre Company is proud to present another original adaptation of a Shakespeare classic set in the beautiful surrounds of the Albury Botanic Gardens. BYO your favourite picnic, picnic chair or rug, or enjoy the food and refreshments on offer in the Gardens. A BYO permit has been obtained for the responsible consumption of alcohol with your picnic meal. The Tempest is believed to have been written somewhere between 1610-11, and thought by many to be the last play that Shakespeare wrote. Indeed, some critics even believe Prospero, with his theatrical “magic” and almost complete control of the storyline, to represent Shakespeare himself, and Prospero’s final speech to be Shakespeare’s farewell to the stage. The Tempest is indeed a rare delight of Shakespeare’s, featuring numerous musical pieces, fantasy themes, elements of tragicomedy and special sound effects – all of which have been a fun challenge for our performers to tackle. Performing Shakespeare can be a very intimidating experience, directing, no less so. This particular play is a piece that is oft quoted and referenced; a play that many attribute to being more about Shakespeare himself than an old sorcerer’s grudge, and it contains many elements seen in his other work; there is a jinx of tragedy, of hope, of violence and magic. There is love, love of a father for his daughter, love of a princess for a prince, as well as love of alcohol and just a touch of madness. The task of directing is made infinitely easier when the available cast and crew are of such a high standard. Traveling from Canberra, where I am based, each Sunday would have been a much more difficult experience, if the work being performed was not so brilliant. TOTCo is a company focused on the concept of community and this is somet}ting it is very successful in maintaining – this has been especially evident in my cast. The Tempest would not be possible without the amazing effort from all involved, particularly Producer and Co- Director Peter Uniacke. My thanks go out to him and to the entire theatre company. I know that the TOTCo performance of The Tempest is set to entertain and it will be a performance that will inspire those watching to attend the next Shakespeare in the Gardens in 2017; it might even encourage some of you out there in the audience to take the leap and audition yourselves! Costumes were designed and put together by Costumer Ro McGillivray and her #1 assistant Pamela Krause, as well as additions by cast and crew. Ro won the Best Costume award for her extensive work on Much Ado About Nothing with TOTCo last year at the ZONTA awards and was keen to put her love for all things sparkly and ridiculous to use in The Tempest’s circus theme. Ro would like to thank her sweatshop employee & mumma Pamela for costume production and deciphering her scrawl on post-it notes. The scenery you see set up in the garden has all been designed constructed and hand-painted by Producer Peter Uniacke, with assistance from cast and crew. The vision was to complete the theme of a Victorian era carnival, with all panels 1.8m high and ranging from 2 to 7.4m in length! They were painted with art acrylic water paints and hand-sewn with waterproof backing to block out the sunlight. This adds up to a total of 6 screens and three arches – a big project but an effective one!